Following the spectacular 650th issue, FANTASTIC FOUR #6 keeps the tension flowing. Galactus has returned to Earth, which is never a good thing. But Galactus isn’t the only one making a surprise return. Dr. Doom, arguably Marvel’s greatest villain, is back. And just as always, he’s set himself up on a pedestal to be the world’s ultimate savior. 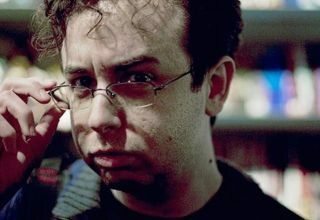 Writer Dan Slott shows no signs of slowing down with his run on FANTASTIC FOUR. What better way to follow up a super wedding than with a battle between the Fantastic Four, Dr. Doom, and Galactus? Plus, Doom’s got a new trick or two up his sleeves to make things more interesting. 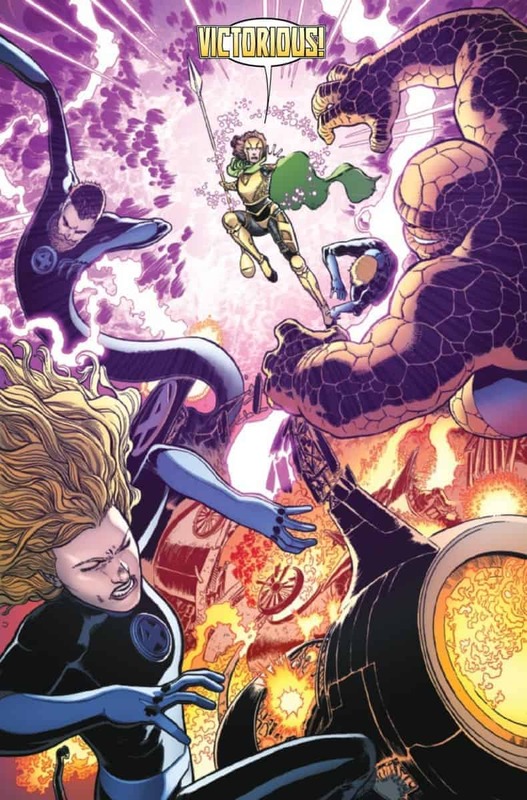 Artist Aaron Kuder lends his talents to FANTASTIC FOUR #6. 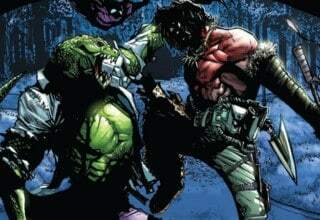 Though there have been better looking issues in the series thus far, Kuder’s art is an appropriate fit for the high-octane action depicted herein. Picking up right where FANTASTIC FOUR #5 left off, we find Galactus attacking the Earth once more. Yet, for whatever reason, he chose Latveria of all places to invade. Not a good idea, if you ask me, especially when Dr. Doom is back in town. Doom is throwing just about everything he’s got at the evil Celestial, to some affect. In the meantime, the Fantastic Four make their way into Latveria, only to be stopped by Doom’s new follower Zora (who we met in FANTASTIC FOUR #1). Zora now goes by the name Victorious, as she’s somehow been imbued with the power cosmic. Which, essentially, makes her a Herald of Doom. FANTASTIC FOUR #6 page 8. Courtesy of Marvel Entertainment. 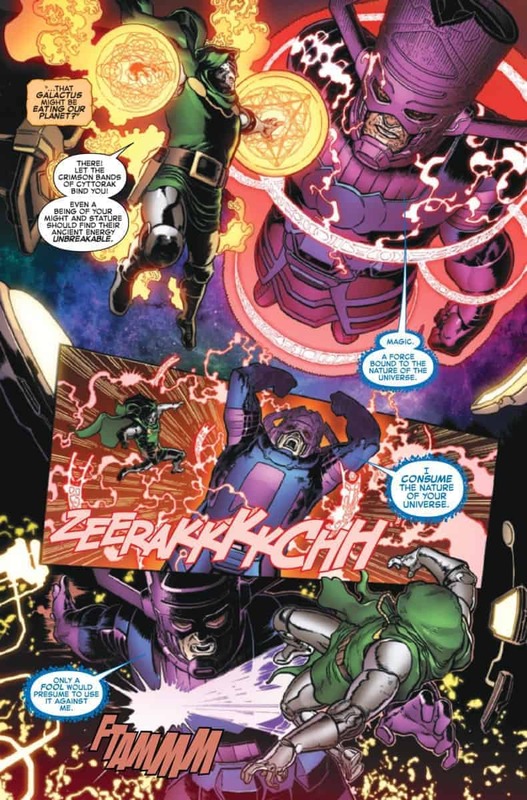 While Victorious fends off the Fantastic Four, Doom aptly deals with Galactus. 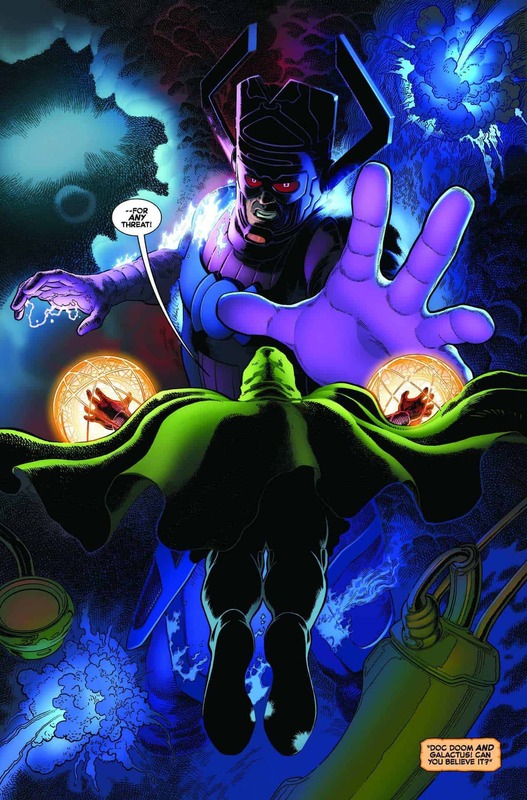 Doom misdirects the Celestial with some magic to destroy his regulators. This sends Galactus into some sort of frenzy; his hunger becomes aimless. Or so we think. Galactus’ aim quickly shifts from devouring our world to reclaiming the power cosmic which was imbued into Zora. Of course, Reed views this as an error, but knowing Dr. Doom, everything’s going exactly according to his wicked plans. We’ll have to wait until next time to find out exactly what Doom’s true ambition is. So far, the return of the Fantastic Four has been an emotional ride. Dan Slott has spared no expense in making sure we understand just how important and impactful it is to have the team back. FANTASTIC FOUR #6 is a two-pronged sword; we get more of the Fantastic Four, and we also get to see Dr. Doom back in action. 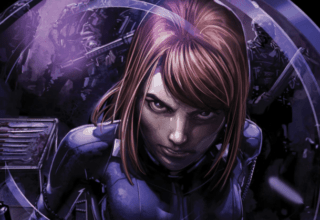 FANTASTIC FOUR #6 really is nonstop action. Between Doom fighting Galactus, and the Fantastic Four fighting Victorious, there’s scarcely a moment to breathe. And yeah, that can sometimes be a bad thing, but in this case, it’s actually very enjoyable. Most of Slott’s FANTASTIC FOUR has been emotionally-driven. 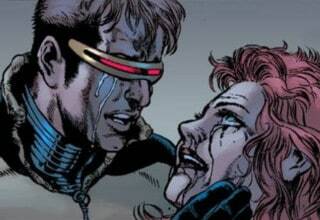 Even FANTASTIC FOUR #3 and #4, which were more focused on action, were centered on an emotional story. FANTASTIC FOUR #6 page 12. Courtesy of Marvel Entertainment. Slott’s most recent issue takes a break from that for more intense drama. This makes sense, especially in terms of the scale he’s playing with. If you’re gonna go big, go big! Don’t just settle for Doom or Galactus, use both! This is a Fantastic Four conflict I can easily get behind, and it looks to only get better. Doom’s return to maniacal, arrogant villainy is so damn fun. Granted, it feels a little forced (I’d still like to really know what made him evil again after his time as Iron Man), but it feels right. You can’t really have a Fantastic Four book without Dr. Doom in the villain’s chair. And this is Doom as we know and love him, have no fear. I can’t wait to see more of him, and go further into his newfound villainous psyche. 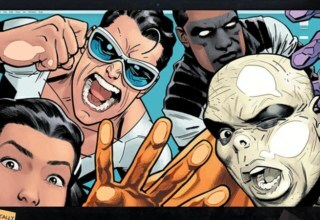 FANTASTIC FOUR #6 looks appropriately cartoony, thanks to Aaron Kuder’s artwork. Which is a good thing, mind you. I mean, when you’ve got Dr. Doom fighting Galactus, how could you expect that not to look cartoony as hell? But, to that point, there are also more than a few moments where the art just feels a little too wonky. 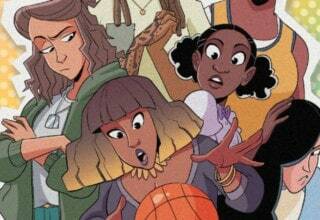 My problems mostly lie in some of the character designs. It’s not that they’re bad, more that they’re sometimes inconsistent. And if there’s one thing I can’t stand, it’s inconsistent characters. Also, again, much as I enjoyed bearded Reed Richards, I think it’s about time he shaved. It looks especially bushy in Kuder’s style. FANTASTIC FOUR #6 page 18. Courtesy of Marvel Entertainment. But, to his credit, Kuder does a great job drawing Doom and Galactus, which were probably the most important characters to nail for FANTASTIC FOUR #6. Doom’s mask is appropriately mangled and demands your attention. 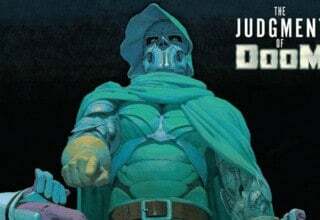 Hell, Doom just does that in general, and it’s in part because he always looks so damn cool. And powerful and threatening as Galactus may be, he still looks pretty goofy. Kuder clearly had a lot of fun drawing him. 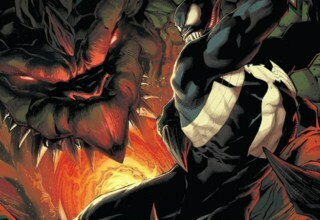 Should Kuder continue working on FANTASTIC FOUR with Slott, my only big recommendation would be tighter character work. Otherwise, this stuff is fun to look at, so don’t be afraid to give it a shot. What’s Doom Planning for After FANTASTIC FOUR #6? If there’s one thing I’ve learned from all my years of reading Marvel comics, it’s that you can always assume Doom has something worse up his sleeve. And he certainly does, given the ending of FANTASTIC FOUR #6. My bet is that he’s found a way to control Galactus, but I seriously hope that’s not the case. That would be disastrously bad. We’ll have to wait for next time to find out, though. Dan Slott pulled out all the stops for FANTASTIC FOUR #6. This one’s a pure thrill-ride, through and through, and I’m happy he took a chance to fill this issue with more action. It’s about time we properly saw the team back in action, against a good old-fashioned cosmic threat. 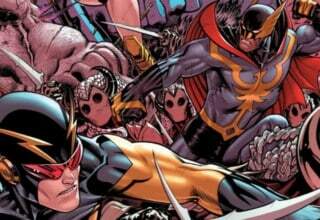 Aaron Kuder’s art is mostly successful. Despite a few character hiccups, his pages are fun to look at, and they’re perfect for the insane action taking place. Again, I’m not sure what Doom’s planning, but I’m excited to see it all unfold. It sure is great to have him back. Remember I said that for when I possibly change my mind somewhere down the line. 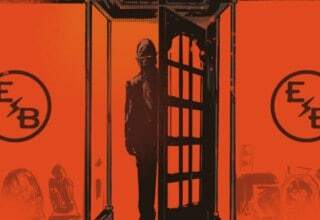 FANTASTIC FOUR #6 has a very classical feel to it, especially for a Fantastic Four issue. It's filled with explosive action and features some of the best Fantastic Four villains. That's certainly enough to forgive a few artistic hiccups.